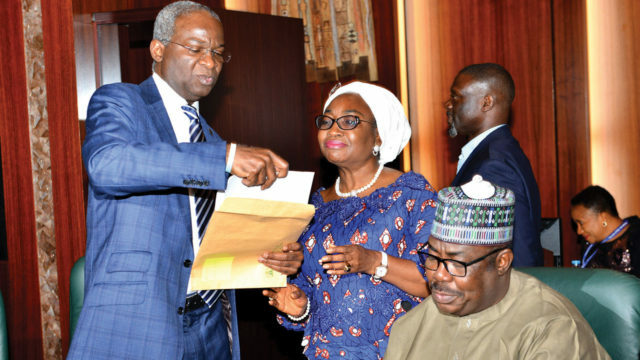 Head of Civil Service of the Federation, Winifred Oyo-Ita (middle), with Minister of Power, Works and Housing, Babatunde Fashola (left), and the Minister of State, Mustapha Baba-Shehuri, during the Federal Executive Council (FEC) meeting in Abuja…yesterday. PHOTO: PHILIP OJISUA. The Federal Executive Council (FEC) has approved a draft white paper on the Technical Committee on Industrial Relations Matters in Public Service which seeks to check what government considers excessive trade unionism, abuses by employers and illegal private practice by public health workers, among others.The Minister of Labour and Employment, Chris Ngige, made the announcement at a press briefing after the council meeting presided over by President Muhammadu Buhari at the Aso Villa. He recalled that a panel to smoothen industrial relations was inaugurated in April 2016 and submitted its report in October 2017, after which he chaired the committee to draft a white paper on the report with the intent to harmonise contentious areas. Highlights of the report include that employers who lock out workers must pay them for the period they didn’t work, while a no-work-no-pay rule should be applied by employers in cases of industrial action. It also specifies no more than two-term limits for government employees elected into executive committees of various labour unions to check abuses. Ngige also announced that the white paper approved a seven-year limit for medical personnel undergoing training by which time they are expected to pass their exams and quit residency. The gross abuse of private practice by health officials in full government employment, cases of public school teachers also operating their own institutions and similar infractions are equally to be addressed by the new regulations.On the new minimum wage, the minister reiterated government’s insistence on settling for N24,000, a figure it could implement, querying the sincerity of some organised private sector operators who were not paying the current N18,000 minimum wage, yet proposed N30,000 for government. His words: “The Federal Executive Council approved the draft white paper on the report of the Technical Committee on the Industrial Relations Matters in the Federal Public Service. As you might all be aware, the Federal Public Service in Nigeria has been bedeviled with all sorts of problems and conflict areas. “So, over time, government has set up various committees, brought out establishment circulars from the various government agencies all in a bid to stem the tide of industrial disputes. “These contentious areas are the enforcement of Section 43 of the Trade Dispute Act Law of the Federation 2004. “But when workers go on strike, the principle of ‘No work, no pay’ will also be applied because that principle is enshrined in that same section of the Act.”However, the Nigeria Labour Congress (NLC) has described the ‘no work, no pay’ rule as an attempt to frustrate the conclusion of a new minimum wage. Its president, NLC, Ayuba Wabba told The Guardian in Abuja that the right to embark on strike action was legitimate and cannot be taken away from the working class. Besides, the organised labour is meeting today to take a final decision on the new wage. Wabba told the News Agency of Nigeria (NAN) yesterday in Abuja that the struggle was on course, insisting on the N30,000 figure pleaded for by the organised private sector. “So, as organsied labour, we will be meeting tomorrow (today) in Lagos after which we will brief newsmen on the outcome of our decision.President, United Labour Congress (ULC), Joe Ajaero, said they had been taken for granted by the minister, adding that the alleged sloppiness in talks could force indefinite strike from them.